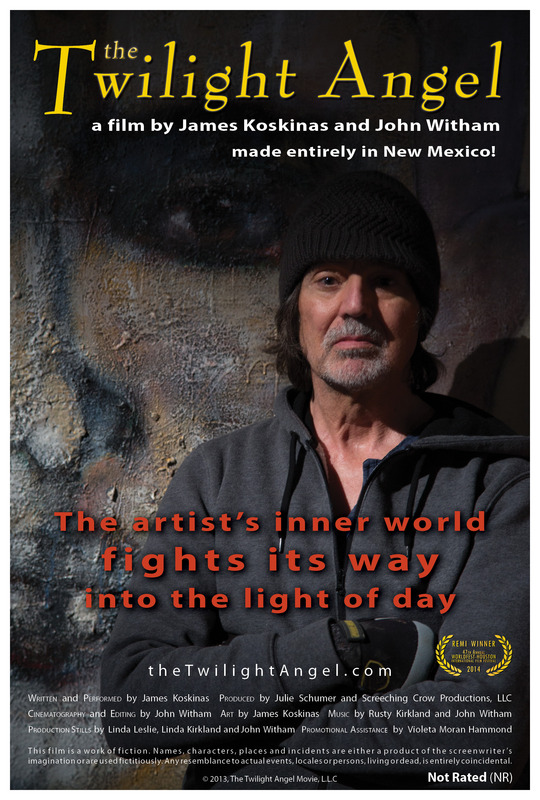 After almost a year and a half of working closely with James and Julie to produce the Twilight Angel, preparing for and promoting the film’s premiere at the Jean Cocteau Cinema in Santa Fe has been a strangely insular process. Being self-distributed and self-promoted, we had to get word of the film out as best we could ourselves. James was working the street like a madman, spreading the word face to face. My first priority was to get him the tools he needed, flyers and photographs, to support this part of the campaign. I was also working the back end of our promotional activities, updating the website and Facebook, making sure the old and new video shorts on YouTube were showing up and linking back to our site and the event. For instance, James did a bit of performance art painting on Canyon Road in front of Selby Fleetwood Gallery, I documented it on video and then put an edit up right away. It was almost like the old broadcast days for me: shooting a piece, editing it and sending it out that same day. James wrote a blog piece about the efforts at marketing with authenticity. James had an invite to participate and show a painting in support of Mental Illness Awareness Week in the Inside Out Show at James Kelly Contemporary Gallery. 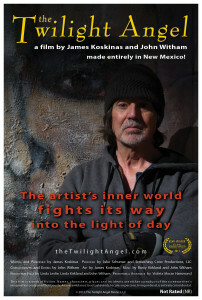 It was a good synergy to work with this group and helped emphasize the connection between groups doing art therapy with folks that have mental or emotional illness and the process going on with the character in our film. The particular painting James showed was the iconic “Turner” which we have used as an identity graphic for the film. We sent out a press release about the show that helped result in an article by Michael Abatemarco at Pasatiempo. I then also shot video interviews at the event and posted them up on YouTube right away, helping to publicise the Inside Out cause and, by association, the Twilight Angel. So, I would see James occasionally at these overlapping events, but mostly I worked from my studio – as usual, editing, writing and publishing these connecting pieces. And when we did get some press or make a connection with an affiliate, I’d make sure all our social media knew about it by giving James the links. And it was during this time that it happened I was also working with Eric Martinez of Los Foodies Marketing Group, shooting and editing promo-pieces for local restaurants and the non-profit organization St. Elizabeth Shelter. There are no coincidences, Eric is a mastermind of social media marketing and we tapped his talents to help promote the Twilight Angel premiere. James is a big advocate of working with affiliates. The most obvious starting point there was the Selby Fleetwood Gallery where both James and our Producer, Julie Schumer, show their work. James made an agreement to place Twilight Angel flyers at the gallery and to post an announcement to their email list. We would have Selby Fleetwood Gallery postcards promoting James’ other work available at the Jean Cocteau Gallery, where the paintings from the Twilight Angel were going to be on display. Eddie Buchbinder, from the Selby Fleetwood Gallery agreed to come down to the JCC and be interviewed on camera about James’ work. He spoke marvelously in this piece, an excerpt from the full interview. The Jean Cocteau Gallery showing of paintings featured in the film (our “supporting cast,” as we like to call them) was enabled by Sam Atakra Haozous, the manager of the gallery at the Jean Cocteau, and an artist himself. HIS work was hanging in the gallery during this time and he chose to take it down a few days early in order to facilitate the concurrent exhibit of art and film. It was a great opportunity, made possible two years in advance of getting into the regular schedule of the gallery, through this gesture of support by Sam and the JCC General Manager, Melania Frasier. The Twilight Angel has been blessed by many angels in the course of it’s development and deployment into the world. This recent effort by Lenore Gallegos, who got us the gig at JCC, and Sam and Melania is an affirmation that this unique little film has an appeal and resonates strongly with an audience. And there was more. In addition to James’ direct action at spreading the word about the screening, Ron Whitmore, the owner of the local artist’s supply mecca Artisan also affiliated with us in sending out an email blast about the show. The connection to artists everywhere is clear and we appreciated the synergy. Many in James’ network of associates and friends have also helped publicise the screening. From the start it has been a grassroots effort and our early fans have supported and sustained us during the production. And now the network continues to grow. As a follow-on to the Pasatiemo piece about the Inside Out show, Michael Abatemarco interviewed James, Julie and I about the Twilight Angel and wrote this insightful article. James Hart helped announce the event on Facebook. And, as mentioned earlier, Eric Martinez not only helped spread the word to his social media network, but helped me put together a video production plan for documenting the premiere. An excellent videographer he has worked with, Jorge Paez, was recruited to do the filming,- resulting in this piece. My gratitude is continually refreshed by the reaction the film garners. I am honored to have been able to do my part to create this fim and enjoy the process of getting it out into the world. Well, the opportunity has come again! The Twilight Angel movie will return to the Jean Cocteau Cinema for a reprise screening after the sold-out premiere. This next show will be Sunday, December 28 at 3:30 PM.